Delightful as “Doctor Jones” is, probably the most interesting thing about this record is that I’m covering it at all. “Barbie Girl” – smart as it was – was also obviously a novelty record: for Aqua to return not once but twice shows that Europop enjoyed more commercial clout in Britain than it had in years. The classic form of Europop is the holiday smash, which sets some ground rules for the genre: it has to be catchy enough for anyone to recognise it on a minimum of encounters, and it should be essentially a-lingual – simple and nonsensical enough to make the idea of a language barrier a mockery. Pop that the polyglot audiences of Europe could embrace, when brought together in a sangria haze. With European Union – and the rise of pan-European cable channels – big cross-continental audiences weren’t just for holidays any more, and the 90s were a boom decade for Europop. In the UK, meanwhile, Europop appealed to the new audiences being brought in by supermarkets and Woolworths. Kids liked it, casual record buyers liked it, students and post-students liked it, and it’s the sort of thing dedicated record shops tended to hold at arms’ length. This feels a good entry to drop some broad Europop analysis in, because “Doctor Jones” is as straightforward as “Barbie Girl” was layered. It’s notionally about Indiana Jones, but there’s no sense of that in the song – only in the video, and then only as a game of dress-up (including, as Wikipedia helpfully warns us, a “stereotypical voodoo tribe”, perhaps in homage to the Indy films’ nuanced and well-researched portrayals of other cultures). In fact, as a song “Doctor Jones” is “Barbie Girl” played absolutely deadpan: a cartoon romance two-hander – no song with Rene Dif on it is going to not be a cartoon. He sounds less slavering as he makes the transition from plastic action figure to cardboard pulp hero: Lene Nystrom sounds slightly more winsome switching from doll to damsel in distress. What Aqua have also done, though, is absolutely stuff this song with hooks. “Barbie Girl” had two – the chorus and “let’s go party” – and they were both deliberately annoying. “Doctor Jones” bounces with them: a really pretty verse melody, “Baby I am missing you!”, the yippee-i-yoos, and a chorus just as catchy as “Barbie” but a bit less irksome. It turns out the formula works even when you strip out the satire. “Doctor Jones” is pure froth, a lot less interesting and dense than its predecessor but ultimately rather more likeable. Since I’ve never met Ed or James BC, I don’t think you can really hang a charge of FT cliqueiness on them, Punctum! Anyway, Q magazine – to be honest, I hardly notice it any more. I mean, I follow a bunch of music journos on Twitter, and Q hardly ever gets mentioned. Nobody says “Wow, did you read…?” about a Q review. If someone says something interesting in a Q interview, it’s in the papers the next day anyhow. The circulation’s halved in the last year, and readership dropped 40% the year before that. It’s scrapping for identity and readers in the middle of a bunch of roughly identical magazines, most of whom have more authority or a more clearly-defined taste. The thought of buying it is…. it’s impossible to imagine being so desperate. (Though tbh I never buy music magazines, so I’m not the best person to ask there). So while I think Tommy Mack, Ed, Punctum et al have decent points about its failings, it’s also never seemed less relevant. #58 Everything’s a travesty with you! I’m not attacking you for not getting the reference. I’m just saying that your “JUST LIKE FASCISM!” point is a bit flat because Ed had already put it in his post. Re: peak Q. Isn’t it about now, maybe 6 months earlier, in Popular time? This could be my own biases speaking but when people refer to the BHN review mess, I get the feeling that they are generally talking about what Q and Select said, which would seem to indicate that their influence at that point might well have been at its zenith. Also ties in with Tommy’s reference to OK Computer earlier on – people still talk about that album coming top of some poll or other for Q at around this sort of time. 1) Making up a spurious “50 best” or “50 greatest” list every single issue, which always contained the same canonical bands in a slightly different order. They no longer do this, and the magazine is a bit better now. 2) Having more lifetime achievement awards than regular awards in the Q Awards. They do still do this. 3) The general public finally losing interest in U2, the quintessential Q band, with the release of No Line On The Horizon. My own Peak Q was 1987-88 – it was a fine gateway drug into the harder stuff (NME/Melody Maker) and a bridge from the canon stuff I was being exposed to at school into current music. The affair came to an end shortly after I bought the first Wonder Stuff album, purely on their recommendation. #60 If they ever made any attempt to set the white-guy guitar band agenda I’d be a bit more sympathetic, it’s that they’ve always needed all the other magazines to tell them which white guys it’s OK to like before they’ll put their money down. Hence the Be Here Now thing, hence bad records like R.E.M.’s Reveal get 5 stars because when the previous record came out everyone else said them it was probably OK to like them again. Even Mojo put the White Stripes on the cover before Q did. Reading Q magazine is like reading an ‘On This Day…’ nostalgia column about bands everyone was getting excited about 3 years ago. I started reading Q when it first came out – it was a novelty to have such a glossy, colourful representation of the music I liked. The downside of such (relatively) high production values was that it inevitably seemed to lead to a conservative editorial policy and a focus on the same few bands. I still read Mojo albeit with decreasing levels of interest. Following on from Q was Word which seemed torn between glorifying the olden days of yore and excitedly proclaiming anything that happened in the last ten minutes. It might have been aiming for cross-generational appeal but it often came across as the kind of magazine the two guys from ‘Peep Show’ might come up with. I’ve bought maybe two issues of Q in my life, to read on trains, but there’s enough overlap in Q man’s reputed tastes and my own that I’ll take up his (straw) mantle here. It’s possible to see yourself as – or aspire to be – educated and/or broad-minded without claiming to be an authority on a particular branch of music. Why would Q man consider himself an authority on soul music because he occasionally plays What’s Going On? Or perhaps: what Q man would consider himself such an authority? If that album is his only soul album he’s better educated (even if only a little) than someone who’s never heard any, and if he likes it and is open to the idea that similar stuff could be good then he’s more broad-minded than somebody who dismisses all soul music out of hand, but neither implies a claim to authority. There must also be plenty of Q readers who dismiss entire branches of music on the basis of limited examples of it, but I doubt they’d claim authority in those types of music either, just an instinctive dislike of them. There are plenty of people who do that, not just Q people. I bet it’s happening right here! Hands up all who are dismissing the idea of five stars for All About Chemistry without ever having heard it? Keep your hands up if Q’s rating of All About Chemistry feels like further evidence of how rubbish the mag, the band and that kind of music are… even though you’ve never heard it. I wouldn’t want to underestimate the value of instinct in determining our responses to entire branches of music, even on the basis of limited examples. Those instincts can act as useful attention filters, if the examples we’ve heard are good ones. If you’ve heard and disliked OK Computer, I can be fairly confident that you won’t like much Radiohead. If you like it, you’ll probably like more of their albums. I wouldn’t be so confident if your test case were Kid A, because it isn’t a typical Radiohead album. If you’ve only heard – and hated – Be Here Now, I have no real idea whether you would like Oasis’s better, earlier stuff. I can guess that you wouldn’t like their later stuff much. What’s Going On, as it happens, is one of the few soul albums I own. I bought it a decade ago because it’s so highly regarded, in order to sample a genre I hadn’t really explored. I thought it was okay; it didn’t really grab me. I haven’t investigated further, but am open to the idea that there are other soul albums that would excite me more. I still make no claim to knowing much about soul in general, or even about Marvin Gaye’s overall body of work. Educated? Marginally more than before I heard it. Broad-minded? I don’t know – to the extent that I didn’t dismiss it out of hand, I suppose. An authority? Of course not. Tom’s right: I did misread his review. Also, I was nitpicking dreadfully, even if I was being self-aware about it. Have we neglected to mention Lene’s co-credit on Girls Aloud “No Good Advice”? Ah! Thanks Alan. I was trying to remember which GA songs she had a credit on. Were there any others? Rory @ 71: that’s a fair point. I suppose there’s just such a sneery condescensionin some of Q’s copy coupled with the reverence they’re required to adopt towards the bands who advertise with them that it’s easy to assume a similar ‘oh, I know all about music’ attitude in some of their readership. But yes, I don’t mean to suggest that rock or indie fans shouldn’t dabble in other genres. There’s no law that says you have to spread yourself equally. I think there were two basic ideas behind Q, one of which concerns the reviews section and the other (just as, maybe, more important) doesn’t). 1) Grown-ups don’t generally have the time or intensity to maintain the approach to rock and pop music that teenagers have and that reading the NME, Melody Maker, Sounds, The Face or i-D demanded, and so would appreciate a high-production value magazine that covered a range* of stuff in a simple-to-grasp way (and it’s worth mentioning that in the mid-’80s there was precious little pop coverage in the broadsheets). 2) That whether they were musically relevant or not, the likes of Elton John had much better stories to tell than whoever was on the cover of the NME or The Face that month. And that would make for a better read. Now, none of that made me want to read Q, but has kept it in business for the best part of 30 years. *A range that was, however, limited in many ways, obviously. All I have to contribute to the debate: This was #1 on my 10th birthday. What a milestone! And on my 35th, I see. Not a great time for personally, it was the Year of Four Jobs, but I have a Showbiz Anecdote coming up soon, and it will relate directly to an upcoming Popular act. Nothing to add about Doctor Jones I’m afraid, except that it does seem to be a common surname in pop titles, much moreso than Smith, and is this the first yodelling on a number one since Frank Ifield? My tenth birthday #1 is a few months away, and depressingly it’s probably one of my least favourite #1s of an otherwise epic decade. But more on that when we reach September. I enjoyed Barbie Girl a lot and was pleasantly surprised by the somewhat positive response that got here but this just doesnt do much for me at all. Unexpected bunny notwithstanding this is too much of a you’ve-heard-one-you’ve-heard-em-all type hit. Once was alright but the act was wearing a bit thin here. Occasionally this still comes into my head, out of nowhere. By some distance my favourite instalment in the Indiana Jones franchise. All the Aqua virtues. For me, it’s an 8. I associate this song with Barnsley’s just-about-deserved victory over Man Utd in the FA Cup in February 1998, mostly because I attempted and failed to create a crossover chant celebrating two-goal hero Scott Jones in order to annoy United fans at school. 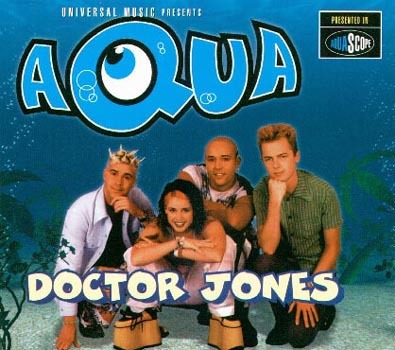 * Just researched Scott Jones – it’s interesting that he faded into obscurity quicker than Aqua did. I wonder if it bothers him that he’s not mention in the same breath as Matthew Hanlon, Tim Buzaglo, Roy Essandoh etc.